Ten years ago, there was a very clear delineation between the digital project team delivering the product, and the business team who commissioned the product. The lines between digital and offline business now are more often blurred. Organizations recognize that customers rarely pursue a purely digital engagement with an organization, or a purely offline relationship. It is better to combine digital experience and a service experience teams because the success with customers depends on a seamless integration. As a result of this blurring, Customer Care and Retail are more directly involved in digital product design from the outset. There’s also more need for cross-platform education on customer behaviours in the different situations and environments. Exciting! Expertise in digital business is obvious at the extremes. The person who consistently calls WordPress “Wordperfect”, or thinks of Amazon as a book seller is probably not that digitally savvy (this happened), let alone understands a customer’s intricate cross-platform dance throughout their engagement with an organization. Worst case, they don’t get digital and don’t care. These stakeholders are found more often when you’re working in cross-platform teams, and/or with people who perceive that their work and job will be negatively affected by the digital project. You can help to create a collaborative environment in meetings by asking questions around the business requirements, and being assertive in your user focus, design and creative contributions. That sets a tone of mutual respect for all areas of expertise. 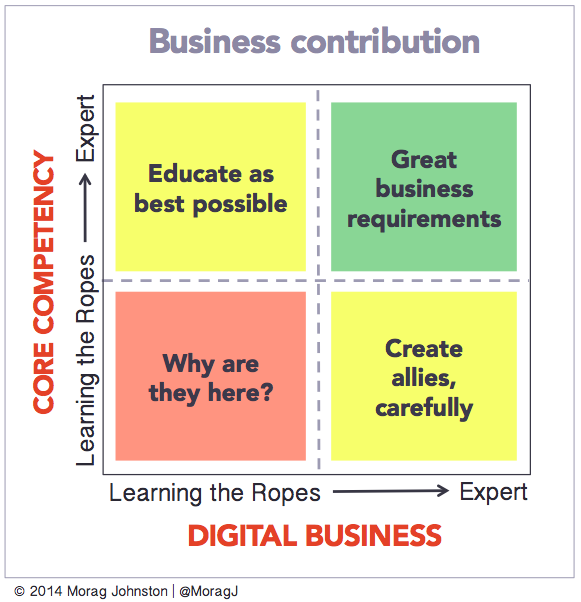 The graph below shows business/subject matter expertise mapped against digital business expertise, and how to treat clients who fall into each quadrant. Again, the top right quadrant marks the dream client. Because they understand the business from multiple dimensions, you are likely to get good business requirements from them, although they are more likely to stray into design requirements than most. They have likely done a project like this before and will have a vivid picture as to how they see the project evolving and the end result. WHAT TO DO: Your best. You will learn from these stakeholders. This is a fairly common scenario. Remember, it is more important for the client to be an expert in their business than in digital. WHAT TO DO: Make sure there’s some one on the greater team who is contributing the digital business expertise. Whenever there is a lack of knowledge, the vulnerability variable comes to the forefront. Take the opportunity to rephrase their comments where you can and don’t draw attention to their lack of knowledge unless they are openly asking questions. Draw from their knowledge of the offline realm for parallels. Make sure team members are clear on the limits of their accountability, and know how to deal with hand offs. Be wary too of the stakeholder who jumps on the latest and greatest product/platform/service as the solution for their experience design. Review their vulnerability profile: are they hiding a lack of knowledge, or are they genuinely enthusiastic but not that knowledgeable? It may take a few interactions before you determine why they are on the project team. They may be the client representative with digital business expertise. Part of that expertise includes knowing that there needs to online-offline integration; they will form the bridge to the rest of the team. WHAT TO DO: Keep drawing attention to the need for the two realms to be bridged until the other stakeholders start to do it for themselves. Do not ally yourself with this person at the expense of higher-weight stakeholders. WHAT TO DO: It may take MORE than a few interactions before you determine why they are on the project team. If they are a key member of the team, keep digging until you find out what their super power is. They may be experts in making political alliances, or acting as relay for the CEO or top project sponsor. Those who are powerful enough will admit their lack of knowledge and openly state why they are there. In this case, that power is their core competency. If they can make no contribution, then find a way to work around them or ask for them to be replaced.